It Can’t Happen Here. Photo: Arno Declair. The Berlin theatre scene in the months of October and November is an embarrassment of riches. Major theatres open several new premieres and offer works from their repertory: radical interpretations of classical works, dramatic adaptations of novels, new plays based on documentary material, and ensemble creations about contemporary social topics or situations. In the course of six weeks, I saw twelve major productions in the five major theatres: Deutsches Theater, Berliner Ensemble, Volksbühne, Schaubühne, The Gorki, and one boulevard comedy at the commercial Renaissance Theater. 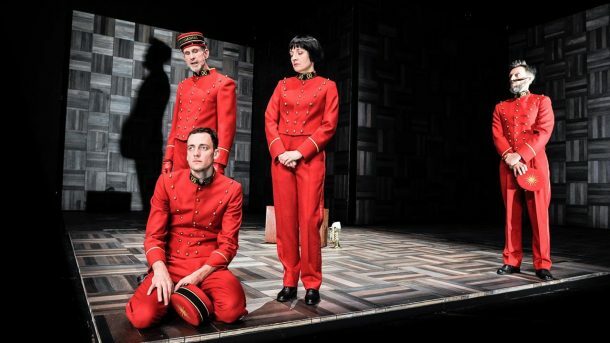 Berlin is definitely a theatre town where theatre politics and politics about theatre arouse public passions to a degree inconceivable in New York. The world of politics is an integral element not only in a theatre’s choice of repertory but also in its directorial approaches. Common among the productions I chose to see in the course of six weeks, I noted two tendencies in terms of underlying political topicality: the political character of the post-election United States, and the problem of identity in a world in flux. Obviously, the 2016 US presidential election and the situation of immigrants and asylum seekers in Germany have brought to the surface social tensions and political conundrums that have compelled theatre artists to endow their work with an intense, at times shockingly radical, aesthetic. I have grouped the productions loosely according to these two major topics, politics and identity. In this first installment for the spring issue of European Stages, I will focus on the productions that evoked resonances with America since the Trump election. The second installment, to be published in the Fall 2018 issue, will deal with the productions where the problem of identity is explored. Of course, politics and identity are interrelated forces that inform the human drama on stage. However, it struck me how the particular American political topography and the problem of identity in an adversarial world of shifting power games formed the cores of very diverse play choices and production styles. 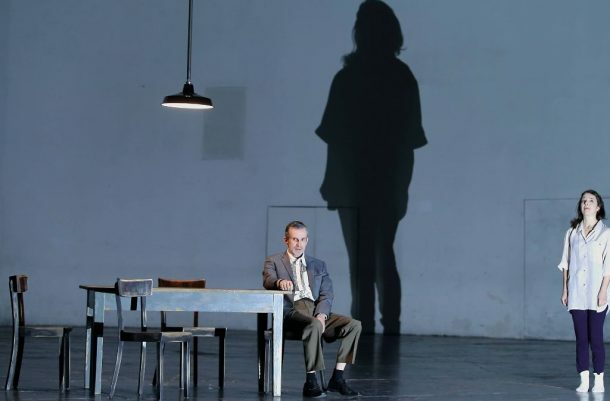 In fact, at Deutsches Theater (DT) three plays put America literally on the stage: Amerika, based on the novel by Kafka; It Can’t Happen Here, adapted from the novel by Sinclair Lewis; and Arthur Miller’s Death of a Salesman. Even Berliner Ensemble’s (BE) Caligula by Albert Camus can be seen as a reflection of present autocratic developments. A multi-media installation by Tino Sehgal, coupled with Samuel Beckett’s short pieces Not I, Footfalls, and Eh, Joe, opened the Volksbühne-Berlin under the new General Director, Chris Dercon, whose appointment has continued to arouse public vexation. These productions are the subject of the present article. The question of individual courage versus political exigencies are at the heart of the following productions: Nathan the Wise by G.E. Lessing, at DT; The Caucasian Chalk Circle by Bertolt Brecht, at BE; at the Gorki, the Habimah Theater (Tel Aviv) performed in Hebrew Jeder Stirbt Für Sich Allein [Everybody Dies Alone], adapted from Hans Fallada’s 1947 novel based on actual events during WWII. (The 2016 film, Alone in Berlin, is based on the same novel.) Another group of plays raised the question of sustaining individual identity in a hostile environment: at Gorki, The Situation, a performance developed by a multi-ethnic ensemble; Returning to Reims, based on documentary material by journalist Didier Eribon with autobiographical additions by actress Nina Hoss at Schaubühne (St.Ann’s Warehouse hosted the production in February 2018); Versetzung [Transfer], a new play by Thomas Melle at DT. Two productions defied categorization; Zeppelin, devised by Herbert Fritsch from works by Ödön von Horvath, at the Schaubühne, and Florian Zeller’s Hinter der Façade [Behind the Façade], an acerbic comedy about marital relationships and hypocrisy at the Renaissance Theater, a historic art deco theatre building that survived WWII bombings, completed my Berlin theatre rounds. Kafka’s unfinished 1912 novel, Der Verschollene [The Lost One] traces the adventurous mishaps of Karl Rossmann, a sixteen year old boy sent by his parents against his will to America. In director Dusan David Parizek’s adaptation, Karl’s tragicomic, peripatetic descent begins high up on the bow of the ship as it anchors in New York harbor. Parizek’s architectural stage design opens with a head-on view of a ten-foot-high bow where Karl who made the crossing as a stoker—the first chapter in Kafka’s novel is called “The Stoker”—meets his Uncle Jakob, a very rich businessman. As the ship’s bow gradually disappears into the stage floor, young Karl, played by Marcel Kohler with an engaging innocence and enormous eyes, emerges in full view as a beautiful very tall young man. He is a foot taller than his uncle, played with cagey authoritarian humor by Ulrich Matthes who subsequently takes on the various roles of authority that Karl encounters. In the course of his American experiences, Karl endures a series of nightmarish struggles with the American dominant culture of commerce in which people are commodities for sale or barter. As a Czech-born man who grew up and studied in Germany, director Dusan David Parisek straddles two cultures. Thus he understands Kafka’s conundrum of existing between worlds. Kafka, a secular Jew raised in the dominant German/Austrian culture and living among Czechs, describes the absurdity of non-belonging in all his work. In his time, America had become the mythical haven paved with “golden bricks” for the poor outcasts of the world. Kafka never visited America but he read about its social customs and fashions and attended lectures that dealt critically with the prevalent racism and industrial labor conditions. Parisek’s Amerika sharply depicts the sensual seductions, crass vulgarity, and violence that mark Karl’s via dolorosa. The childish religious sentimentality appears in the final absurd image of Heaven, “The Nature Theatre of Oklahoma,” one of Kafka’s spectacular inventions in the novel, where Karl joins the ensemble of white foam winged angels controlled by the Theatre Director, played by Ulrich Matthes in golden garb sweetly advertising: “Everyone is Welcome.” The entire “Amerika” dream vision is enacted by five fabulous actors: prominently, Marcel Kohler and Ulrich Matthes; Regine Zimmermann who plays five different women with gusto and humor; Frank Seppeler and Edgar Eckert complete the ensemble. They change shapes and roles in precipitous virtuoso succession to become foils to Marcel Kohler’s Karl Rossmann as he loses himself in this maelstrom of a strange and violent world. My laughter got stuck in my throat as I watched, thinking of the thousands of young people thrust into foreign lands without a language, without a home, dependent on the “kindness of strangers” but always subject to potentially violent rejection. How many today are Verschollene, lost to themselves and the world? H.L. Mencken wrote these and other satirical commentaries during the presidential campaign of 1920; the volume was most recently republished in 2006. After Trump’s election in November 2016, Sinclair Lewis’ 1935 novel It Can’t Happen Here was selling like hotcakes in the United States. Inspired by the European turn to violent Fascism in the 1920s and 1930s and Stalinist terror in the Soviet Union, Lewis describes how a small community in Vermont—an “Our Town” type of place—transforms insidiously into a model of totalitarian terror, replete with a goon militia, a stupid populist autocrat, Buzz Windrip. He is surrounded and abetted by ignorant toadies, foremost among them his chief strategist and spokesman, Lee Sarason. I read the novel soon after the Trump election and was stunned by the uncanny political prescience of this dystopian satire of American populism and its corrosive effects on democracy: the silencing of the free press, the propaganda machine with its fake news, and the whipping up of a vicious and divisive mob mentality. When I saw that an adaptation of the novel had premiered at Deutsches Theater in September 2017, my curiosity was piqued. I was not disappointed. Under the direction of Christopher Rüping, a young high-octane ensemble of actors whips through this descent into political madness in a little over two hours without intermission. Playing in the more intimate space of the DT Kammerspiele with a full-width stage confronting the audience—there are no bad seats—the performance starts in front of the iron curtain of the stage like a town hall meeting. Dressed in costumes subtly reminiscent of Puritan garb, the main protagonist, journalist Doremus Jessup, is flanked by his daughter Sissy as he tells about his family. He introduces Shad LaRue, a man who helps him around his house and garden, and likes to play the drums. Gradually Jessup forays into the present political situation and cautions about the insidious turn toward extremism, noting, though, that “it can’t happen here.” However, he becomes more and more insistent in his warnings: “Don’t think that you are safe! Yes, there is Fear! And what are we doing? Why don’t we go on the street?” A man walks down the audience side aisle towards the stage, protesting against Jessup’s words. The iron curtain lifts, and all hell breaks loose as the stage is transformed into a campaign style environment—the skeletal set design by Julian Marbach with harsh effective lighting by Thomas Langguth resembles a temporary political rally set. Here, a word of praise is also warranted for Lene Schwind and her colorful, inventive costume designs. Shad LaRue, transforms into a hard metal rocker and graduates from his child size drum set to a full-size rock drum set upstage right. A couple of security types casually surround the stage setting up camp chairs and invite audience members onstage to sit in the camp chairs and enjoy American hot dogs distributed from a Buzz Windrip hotdog stand. Then they are forced to listen to Lee Sarason’s speech as it escalates into a mad fascist rant, e.g. “legislative and executive shall be unified” with increasingly martial threats. At the end of this “introduction” to the new regime, the audience members are told to go back to their seats, like going back home after a rally. And then…voila! Bald Buzz Windrip, the winner of the election, appears dressed in a tiger suit accompanied by a wild drum-set flourish. From here, the nightmare intensifies with heavy metal rock music, composed by Christoph Hart, drowning out all reason and underscoring the losing battle against totalitarian forces by whipping up populist mob sentiments. Camill Jammal as Doremus Jessup is the straight foil of reason and courage to Felix Goeser’s outrageously grotesque yet personable Buzz Windrip who performs a broad scale of emotional acts from joviality to pure intimidation. Yet ultimately he is cornered in his solitary aerie by his henchmen who have turned against him; he cowers and pleads in fear like a child, but it is in vain. One by one this “revolution devours its own children”—blustery, slick Lee Sarason portrayed by Michael Goldberg; Colonel Haik, played as an utter nihilist by Benjamin Lillie; Shad LaRue, played by Matze Pröllochs as a primitive rocker and brutal militiaman—all are ultimately felled by their own vicious force. But they had already eliminated all voices of reason and political morality, represented by Doremus Jessup, his daughter Sissy and her fiancée Julian—both parts played by Wiebke Mollenhauer—who become victims to brute power. As I watched this performance, I was stunned by my own sense of helpless fascination. Death of a Salesman. Photo: imago. The back of the program booklet contains a statement about Arthur Miller’s play: “Death of a Salesman is a social tragedy and the story about the loss of identity: Loman becomes the victim of the unconditional American dream of success and financial wealth.” Director Bastian Kraft’s staging renders this emblematic American play with an abstracted, cool energy, stripped of any atmospheric touches. Ben Baur’s stage is a large empty rectangular space with one central opening in a flat gray back wall. The only furniture consists of one non-descript large square table with four chairs that serve as the center of the Loman home; with a white table cloth added, it becomes the restaurant. No refrigerator, no bedrooms, no outlines of a house, like Mielziner’s original design, to give any atmospheric illusion—just a table where the familial explosions and revelations happen. The cool lighting design by Cornelia Gloth and Stefan Bischoff’s black and white silhouette videos may have been inspired by a T.S. Eliot quote, printed on the front-page of the program: “Between idea and reality, between prompting and deed, falls the shadow.” Throughout the performance, the actors’ actions are doubled by their own oversized shadows. The ironic effect is the actual actors’ diminution in size when compared to their shadows, thus creating the illusion of their actions having great impact. One of the pleasures of true repertory theatre is seeing the same actor in different parts in the course of a week or two. Thus, I was able to see Ulrich Matthes embody the hyper-successful businessman Onkel Jakob and other dominating figures in Amerika, and a few days later he played Willy Loman. Matthes is a small, wiry man with an electrifying stage presence who holds his passions in check. His Willy Loman is not so much an exhausted, pathetic salesman but one who is confounded by how commerce sidelines him—to sell is to mean something, to be someone—it is his source of life, not merely a transaction of commodities. He cannot understand how capitalistic progress so cruelly excludes him. Through video and audio projection, Matthes appears also as Willy’s idolized brother Ben whose shadow hovers over him representing his dream image of success, the man who literally walked from rags to riches. This visual/aural trick emphasizes Miller’s dramaturgical experiment whereby remembered past and actual present are equally operative in Willy’s sense of reality, and are made manifest on stage. The use of video and huge shadow projections affects the character relationships by shifting the perception of time and proportion. At times these shadow projections speed up and crowds of people and chairs revolve on the back wall in a nightmarish vision, working as a visual design metaphor for Miller’s central idea that the play takes place inside Willy’s head. 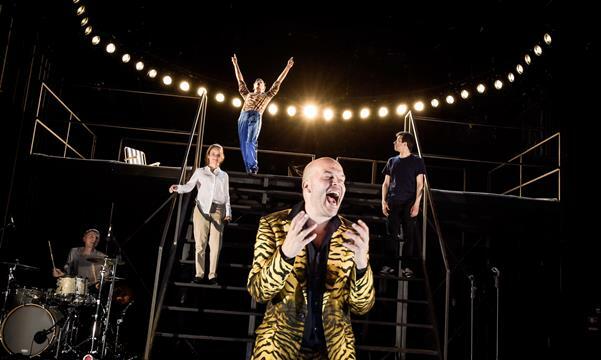 The stage space remains the same and the costumes, designed by Inga Timm, are of a contemporary, utilitarian style with a jacket added, or a shirt taken off to indicate subtle shifts in time or place. There is no attempt to create a visual illusion on stage of Willy’s sons as boys—only by projecting on the back wall rapidly moving shadows on bikes and off-stage voices does the audience share in Willy’s romanticized past of innocent games and the clean open air around their Brooklyn house. Ulrich Matthes first enters through the center back opening; he simply walks downstage to the table, without the emblematic suitcase that has traditionally represented the “American Salesman.” The ensuing dialogue with his wife Linda, played by a rather youthful Olivia Grigoli, transpires rather matter-of-fact, without great emotion; he seems simply puzzled about his confusion and near accident, the cause of his unexpected return home. Biff and Happy, the two sons are played by actors who appear in It Can’t Happen Here. Biff, the older son, is played by Benjamin Lillie, who performs as Colonel Haik, Buzz Windrip’s brutal strongman. As Biff, he is a bundle of pain, rebellion, smoldering anger, frustration, and angst, any of which can explode and unload on his father and mother. Happy is played by Camill Jamal, who portrays the courageous Doremus Jessup; as Happy, he is the hapless but always playfully scheming “company man,” a compliant but irresponsible boyish man, sensitive to family tensions. The German translation by Volker Schlöndorff and Florian Hopf retains the broad strokes of the play, but it seemed to me that the other characters who affect the Loman family life pass through without much of a trace, while the anonymous shadows exert a much stronger effect. All of the actors create an instant ground their characters with presence on stage: Willy’s neighbor and friend Charley, the successful businessman and his son Bernard, the successful lawyer, played by Harald Baumgartner and Timo Weisschnur (respectively); his boss Howard Wagner (Moritz Grove), whose love affair with a reel-to-reel tape recorder is played out on the stage floor; the Woman (Ulrike Harbort) with whom Willy entertains an affair the discovery of which triggers Biff’s resentment of his father; the ironically solicitous waiter Stanley (Jürgen Huth) whose sympathy for Willy balances Howard’s cold uncomprehending dismissal of Willy; and the two young women Jenny and Letta (Ruby Commey and Linda Blümchen) who provide the restaurant interlude with Biff and Happy. However, their effect on Loman is fleeting. Caligula, by the Berliner Ensemble. Albert Camus’ lifelong fascination with the controversial figure of Caligula, the third Roman emperor (37 – 41 C.E.) started in high school in Algiers. He wrote the first version of the play in 1938 at the age of twenty-five. By 1944 he had revised the play and changed the dramatic core significantly; the early romantic view of Caligula as a youthful nihilistic rebel was replaced by a stark political analysis of an autocratic ruler who charmed his way into totalitarian rule over a vapid society of sycophants with his consummate acting skills. The experience of nihilism prompted by the Holocaust, WWII, and the Nazi occupation of France obviously muted Camus’ earlier philosophical thought experiment and forced a stern look at the human condition under political terror. The play premiered in 1945 in Paris with Gerard Philippe as Caligula. BE’s choice to produce Camus’ Caligula strikes home as extreme ideological movements terrorize parts of the world with existential endgames, and amoral autocrats and their plutocratic supporters engage in a cynical winner-take-all power gambit that plays havoc with individual lives and public institutions. BE’s striking production of Caligula in the direction of Antu Romero Nunes, with sets by Matthias Koch, lighting by Ulrich Eh, and costumes by Victoria Behr premiered on September 21, 2017. Performed with daunting energy for an hour and fifteen minutes, the actors take the audience through a bloody progress that begins in a clown show and ends in absolute destruction. The German text by Uli Aumüller adapted and shortened Camus’ play of four acts significantly. Seven actors constitute the cast of characters while the original play lists twelve roles, albeit most of those are brief appearances. The production maintains all the dramaturgical elements of the original text ranging from absurd farce to philosophical discourse: the clown show at the outset with clownish wigs and masks, the androgynous playfulness of Caligula and his paramour Caesonia, the sycophantic behavior of the patricians, and the gradual unmasking of the intimate circle around Caligula. The core of the action is performance-writ-large, with grotesque excesses reminiscent of Fellini’s Satyricon. Antu Romero Nunes explores the random absurdities inherent in the terror that emanates from Caligula’s absolute negation of life. However, the performance aspect, the literal hypocritic or actor-centered nature of political power-in-action informs his mis-en-scene. Casting Constanze Becker as Caligula and Oliver Kraushaar as his/her lover Caesonia emphasizes the mercurial theatricality of the play, in which roles and relationships are as unstable as gender is indeterminate and private and public spheres are fluid. Ultimately, all boundaries and certainties dissolve under the pressure of nihilistic power. Constanze Becker’s virtuoso performance anchors this infernal dance of death; her hands are like claws. When she appears through the fog as Venus with golden horns and on cothurni in a bloodstained dress, carrying a running chainsaw, the vision is both comic and horrific. As the set becomes more and more labyrinthine with long metal shafts creating prison-like spaces, she/he unmasks the patricians’ hypocrisy—their paltry humanity emerges as their clownish masks and false hair become more and more disheveled. The characters representative of Roman society are chameleon foils to chameleon Caligula: Scipio, the poet and friend (Patrick Güldenberg), Cherea, the political advisor (Felix Rech)—both of them will kill Caligula at the end—and Helicon, the slave (Aljoscha Stadelmann) who is charged with fetching the moon. An interesting and jarring element is the suspension of a huge cross as Caligula sits beneath it with his group of patrician friends at a long table, an ironic image of Christ’s Last Supper with his apostles. Later Caligula, hair in two blond braids, dressed in a pink dress plays Ave Maria on a recorder accompanying a singer (Drifa Hansen). True, historical Caligula ruled during the beginnings of Christianity and this image seems to comment on the political exploitation of Christian symbolism and the hypocritical appeal for populist purposes. BE’S Caligula, while shocking in its brutality, fulfills Camus’ accusation against an unjust world of arbitrary power, where human life has become an expendable commodity. Tino Seghal’s installation at the Volksbühne. Photo: Eberhard Spreng. Strictly speaking, this concluding part of my article does not fall into my above established thematic category, however the opening of the Volksbühne-Berlin under the controversial direction of Chris Dercon demonstrated a radical change in leadership and its effect on this venerable hundred-year-old theatre. Questions about direction and quality continue to vex news organizations, and the public: Where is this theatre headed? Will it become an “event stall” for the global culture-market? Will it be a hybrid installation/performance organization with the main “Haus” only one place of operation? Chris Dercon’s past as director of the Tate Modern was already arousing skepticism among the theatre professionals before he was hired. Would he know and appreciate the formal and organizational structures of a tax supported German repertory theatre with a long tradition? The Volksbühne was the theatre where Erwin Piscator had built his vision of the proletarian theatre in the 1920s. It survived Nazi Germany but was badly bombed in WWII. Faithfully restored by 1948/9, it was one of the cultural/theatrical icons in East Berlin; in unified Berlin, it became the celebrated playground of the wildly inventive Frank Castorf and his notoriously megalomaniac productions. Frank Castorf retired in 2017 and the Belgian Chris Dercon was hired despite intense public protests by Volksbühne employees. His first efforts as producer were hybrid dance-installation performances in Tempelhof in September 2017. I did not see those, but on November 10, 2017 I attended the official premiere at the Volksbühne. The evening promised Tino Sehgal installations in various spaces of the theatre, juxtaposed with the Samuel Beckett short pieces, Footfalls, Not I, and Eh, Joe in the main theatre, directed by Walter Asmus who worked with Beckett when he directed his plays in Germany in the late 1970s. It was an event of many flavors that began even before the house opened its doors. Standing in front of the closed entrance doors on a rainy fall evening—two police vans parked in front in the event of more demonstrations against the “new” VB—a few eager audience members and I waited until the doors opened at 6 PM. People entered, grabbed a beer or a glass of wine at a small temporary bar in the lobby, and milled about as at a gallery opening. At 6:30 in one of the lobbies, a technician suddenly began to flick the overhead candelabra lights in a rhythmic on-off pattern accompanied by a vibrating sound loop. Then the audience was invited into the huge main theatre space to find a spot on the raked floor (no chairs) to sit and experience an extremely loud and extremely bright light and sound show—very painful to my senses. After about ten minutes of this barrage we were “exvited” from the theatre to watch more Tino Sehgal installations in the various lobbies on three floors of the VB. I stayed in one lobby close to the main auditorium where a temporary video screen was installed. A gray video image of a manga figure appears: the stylized head of a girl with huge empty eyes and a tiny hole for a mouth spouts some barely audible phrases about a painting of water lilies (Monet? ), a girl in a boat, sun, light…then fade out. A live adolescent girl walks into the space in front of the screen—like a zombie, with expressionless face, she echoes the text of the manga girl, her arms moving in slow curving motions. A boy comes forward from the audience and begins to ask her questions to which she does not respond except to ask him to copy her arm motions. Does he join the girl freely or as a “plant?” All the while some of the audience sits on the floor, some stand or mill about or check their cell phone, some look spellbound, some look bored. I am bored and fascinated at the same time by the entire performance situation. I wander to another lobby and come upon a comparable performance of a zombie like adolescent girl, slightly taller with huge feet with a final question: “What is the connection between a sign and melancholy?” I am puzzled. Then a video shows an adult woman in an advertisement for products: “I am the product…I am no ghost, just a show.” And the zombie comes back to start again. While watching and listening to these children expressing fragments of feeling, I am suddenly struck by an observation: the emotional disconnect between the text and the performer’s face parallels the disconnect between the adults and the children. Structurally, the performance seems to me an amalgam of a happening, and a highly controlled “fluxus” style composite work. Anne Tismer in Footfalls. Photo: Volksbühne. I missed a couple of the other Tino Sehgal installations in the building because we were invited back into the theatre for Beckett’s trio of short plays. Although the theatre is much too large for these intimate pieces, I managed to get a chair close to the stage where I could appreciate the impeccable and delicate direction by Walter Asmus of Footfalls and Not I. Actress Anne Tismer’s precise vocal and physical art captures the emotional depth of both plays. In Not I, only her intensely red lips appear suspended in utter blackness through which she propels the text with explosive energy and pitch modulation. In Footfalls, she is a tall, slender apparition in white dress, pacing back and forth with an exact number of steps in a narrow strip of light, the steps audibly slowing as the light grows dimmer. In Eh, Joe, we only hear the offstage voice of Anne Tismer pricking like a needle at a scab as she retrieves Joe’s memory of their relationship and her suicide. Old Joe in a ratty bathrobe sits stage-right on a chair, his profile bathed in a soft amber directional light from stage-left; his face is also projected on a screen in large full front exposure as he silently reacts to what he hears. The subtly expressive face of Danish actor Morten Grunwald is captivating as it reflects the emerging memory of his sins of omission. Eh, Joe, like Footfalls and Not I, explores the inner world of a past life filled with situations and existential dread, similar to Krapp’s Last Tape. Samuel Beckett crafted his plays, his prose, and his poetry like filigree with threads of humor, irony, and pain. His work demands exact attention from the audience who respects Beckett as a modern classic of the 20th century. Tino Sehgal, by contrast, is an artist of the 21st century whose work is characterized by unpredictability and chance. Born in 1976 of British and German parentage, he has wandered a wide range of intellectual and artistic landscapes. After studies in economics and political science, he turned to dance and performance, challenging boundaries between art and life by creating “constructed situations,” a concept inspired by Italian philosopher Giorgio Agamben. His work has been mostly shown in museums as performance installations. In an interview with Hans Ulrich Obrist at www.arterritory.com, re-published in October 2, 2017, Sehgal comments that “Western culture has these monumental places…at the core of these monumental spaces is a kind of void. There’s no fixed cosmological order inscribed to them rather subjectivity is placed at its centre.” The Volksbühne is such a monumental place. Perhaps Mr. Dercon wants to provide the opportunity for two kinds of subjective experience by juxtaposing Beckett’s exploration of the liminal existential space with Tino Sehgal’s “constructed situations” that blur the boundary between art and life through subjective engagement. The cultural space as the agora for the encounter between art as constructed and art as lived presents the audience as the subjective observer/participant with a political challenge as well that touches on the definition of art and its institutional place within society. Public tax support of cultural institutions has come under scrutiny, if not downright attack in many countries, even in Europe. 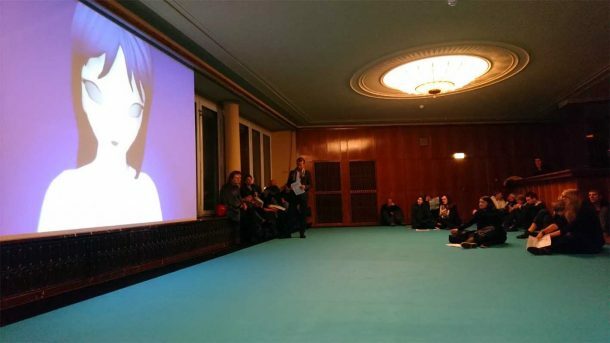 As private sponsorship deals are made, the agency of the individual artist, of institutional leadership, and of the individual beneficiary (not as consumer) has become a socioeconomic question of cultural politics of which Volksbühne-Berlin is a prime example.